Just like other social networking website an attractive profile is the key step to get noticed.If some one liked your video and would go to your profile to learn more about you and find your profile is not yet filled and their is no information about you then he will not even bother to visit your profile next time.So its important to make your profile attractive. As I Already Mentioned there are tons of videos which means there is no shortage of videos.So you should try to post a unique video which is difficult but not impossible.You don't need to post high definition (HD) videos but your videos should be of decent quality.Try to select a specific topic for your video don't mingle unrelated videos. 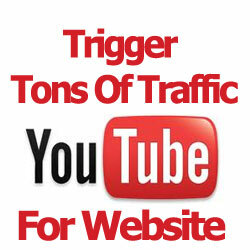 This is the most important part-including your website LOGO and URL is the key to trigger traffic.You should insert Logo in the starting of the video and in the ending of the video or if you have little knowlege about video editing then adding a small Logo with url on the top throughout the video will increase lots of visitors. its very vital to promote your video you can use Facebook.In Facebook sharing videos is the key as user share them with there friends and this forms the chain.If you sit back and don't do any thing it will not improve your video views don't think people will visit your videos by searching.You have to do some efforts to get views.